At £279, it's a serious investment, but this is a pro-quality pedal that will make your guitar sounds and even demo mixes stand out. Emulates a great range of analogue studio effects very well. Can be used as outboard gear. You have only to turn on the radio to notice that mainstream pop and indie guitar playing is more textural and less 'rock' than ever. 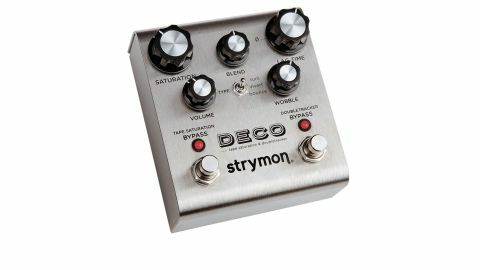 Enter the Strymon Deco. This is a pedal that emulates the kind of effects once achievable only by lab-coated engineers manipulating tape machines, wrapping them up in a smart, brushed-metal enclosure with all the pedalboard-friendly usability of a modern digital stompbox. "Used in front of a guitar amp, the rotation of the lag time control provides a journey through classic studio sounds of yesteryear"
Best positioned at the end of your effects chain in a standard electric guitar rig, the Deco's key control on the left-hand side of the pedal is saturation, which when engaged, apes the warm overdrive and compression that occurs when tape machine inputs are in the red; think Keith Richards' 'acoustic' guitar sound on Jumpin' Jack Flash. On the right-hand side of the unit, we're into the world of simulated ADT - automatic double tracking - which was the precursor to time-based effects such as flange and chorus. As your virtual tape decks get further out of sync, slapback and short tape echo sounds are accessible as you twist the control further clockwise. Used in front of a guitar amp, the rotation of the lag time control provides a journey through classic studio sounds of yesteryear, with Sun Studio-style slapback echo straight from rockabilly heaven and warm flange effects that channel the spirit of Abbey Road in 1967 real highlights for retro pop fans. Flipping an internal jumper to allow the connection of a TRS stereo input cable means that you can use the Deco as an outboard stereo effects processor for recording, and warm up - or totally scramble - any signal you like, from drums to vocals, or even the whole band mix. Although it takes the emulation of old sounds as its starting point, the Deco offers a huge amount of range for the creatively minded player seeking inspiration - we've barely scratched the surface.